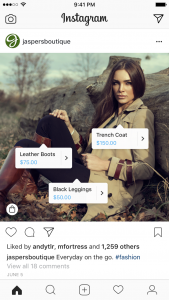 This week, Instagram rolled out a new feature that allows business profiles to sell products directly to consumers called ‘Instagram Shopping’. This new feature adds a new way for consumers to connect with products and brands. Your viewers can now find products for sale within your images and be directed to your website to purchase. In the past, businesses have had to rely on creativity through links in their profile, clever copy and calls-to-action, and adding URLs in post copy, which never existed as an actual link. Choose the photo(s) you’d like to feature. Tag up to five items per image, of twenty items per carousel. Your business must sell physical goods that comply with Facebook’s merchant agreement and commerce policies. You must connect your business profile with a Facebook catalog for your business. You can create this through Business Manager. Once you complete the steps, your profile will be reviewed by Facebook. When it is approved, you will receive a notification and you will be able to turn on product tagging in Instagram. When your account is approved, tap the gear icon on your profile, tap “products,” tap “continue,” select a product catalog, and tap “done.” Then you will be set up! If you don’t see any of these options, it is possible that your account is still under review. The ability for users to shop products on Instagram streamlines the purchase process that Instagram has had in the past. For businesses, it provides more energy to be focused on creating high-quality images, which allow users to view multiple products and view items outside of the traditional shopping experience. Make sure that the products you have posted are for sale. When items are no longer available, be sure that posts reflect that information. Build in additional content with shopping opportunities, but do not let your products override the personality your brand has established. Use Instagram Stories to help reach users and showcase new products you have posted. Be consistent with posting products. Schedule your posts so you can evaluate consistency and content diversity within your profile. If you have more questions, or would like to learn more about how Anderson Marketing Group can help you with your marketing needs, you can contact us here.